Ken's Autos garages in Surrey and Croydon offer a large stock of exhausts to fit a range of vehicles. 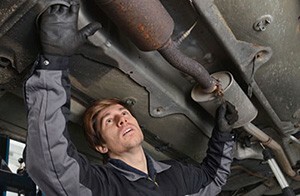 So if your exhaust needs replacing then pop into one of our local garages today. Your exhaust is the only means of getting the noxious fumes such as Carbon Monoxide away from anyone in the car breathing them in. If the exhaust fails then these fumes can get into the car through the air vents leading to the engine compartment. This can cause drowsiness, which whilst driving is extremely dangerous. If you have already had your problem diagnosed, and you know that you need a new exhaust, then why not make use our online booking service to arrange for the work to be carried out. We can even collect your vehicle from your home or work for free!